A battery that can hold five times or more energy capacity than existing lithium-ion batteries could be in users’ hands as early as next year. Prieto Battery, a startup, has developed a 3D solid-state battery structure based on new materials that can hold more lithium ions than current batteries. The new battery will also be less flammable, charge faster and shaped to fit into wearables and PCs as well as larger products like solar panels, said Amy Prieto, founder of Prieto Battery. The battery has been researched for years, and Prieto Battery received an undisclosed amount of funding earlier this week from Intel Capital to help commercialize the technology. 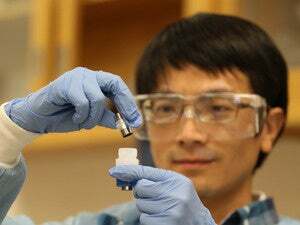 Prieto is working with Intel to develop a battery that could reach wearables and computing devices by 2017. The startup, however, is also talking to an unnamed partner that could result in the release of batteries based on Prieto’s design starting as early as next year. Amy Prieto’s long-term dream is to make cheap and stable batteries for solar and wind farms. The Prieto battery is a complete redesign of conventional lithium-ion batteries, which are based on a 2D structure. The structure of the Prieto battery can be implemented in existing manufacturing processes, and the company’s goal is to license the technology to battery makers. Current batteries have electrodes—a cathode and an anode—with liquid electrolytes that allow charged lithium ions to move around. During a charge, lithium ions move from the cathode to the anode for storage. During a discharge, the lithium ions move from anode to cathode and out to the device using the battery. Existing batteries can take a long time to charge, Prieto said. The Prieto battery eliminates the liquid electrolytes and has cathodes and anodes that are interlocked, which helps increase the density of lithium ions and speed up battery charge times. The anodes—which are made of copper substrates—provide more density than the graphite anode used in existing lithium-ion batteries. Research to produce longer-lasting batteries has been going on for decades. While some batteries made of chemicals like silver-zinc have more storage capacity, lithium-ion batteries are backed by large manufacturers like Sony and Panasonic as they are cheaper to produce. Prieto believes batteries based on its chemistry have a good chance of succeeding as they can be dropped into existing manufacturing and packaging processes. The goal is now to convince battery makers that its technology is better than what is currently available. Intel’s backing is a big step ahead to commercialize the battery technology. The chip maker has manufacturing expertise and could provide access to computing and mobile devices to test the battery.